This is the first spray in a series used to enhance bud burst on Kiwifruit. We use a two fold process. This spray helps the spring upthrust , while a later spraying of BloomMax B works to set more flower buds in the wood for next season. This is a picture of stage 1. 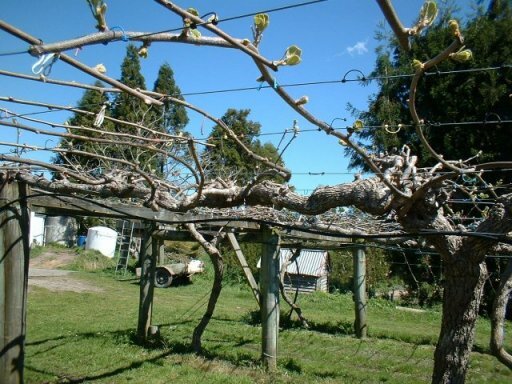 An assessment of this orchard suggests an approximately 80% bud burst has been achieved. The buds closer to the leader can be seen in larger resolution to be bursting. Further pictures will be taken in a week or so when the shoots are further developed. This picture supports reports presented from previous sesaons work on this product. See below the picture for these. Geoff has been following the basic BDMax soils and spray program for the past 4 years. This entails a maintenance remineralisation and compost program as well as the use of monthly applications of Etherics 1000 and Passion Vine Hopper peppers. Last season he also used a BDMax Biodynamic Flowering spray over his orchard at a rate of 500mls per hectare, sprayed twice in the spring just before flowering. Last season his orchard produced the most crop it ever has, either under conventional or organic production, with an average size just above the industry average. Geoff is a spray contractor so ‘Hicane’ was used under conventional management. This spring the treatment has been repeated and we have just recieved the following report from the crop monitoring company ‘Andola Orchard Management’. “You might like to know that Geoff Gibbs orchard had one of the highest bud burst rates (42.3%) for organic orchards. His orchard was the only one to exceed previous years flowers per shoot, whereas every other orchard where we have previous year data were at least half a flower down (per shoot – average being between 2.2 & 3.5). We have this year extended the flowering trials to include sprays for bud set, increasing the winter chill factor and spring bud burst. The overall cost at present for this total program per hectare, would be around $350 per hectare. On present data this suggests an average increase of 1000 trays per hectare, which represents a further $6000 per hectare income.